Ultra-luxury cruise line Seabourn is bringing its guests even closer to the majestic and unspoiled natural wonders of Antarctica with new Ventures by Seabourn kayaking excursions. 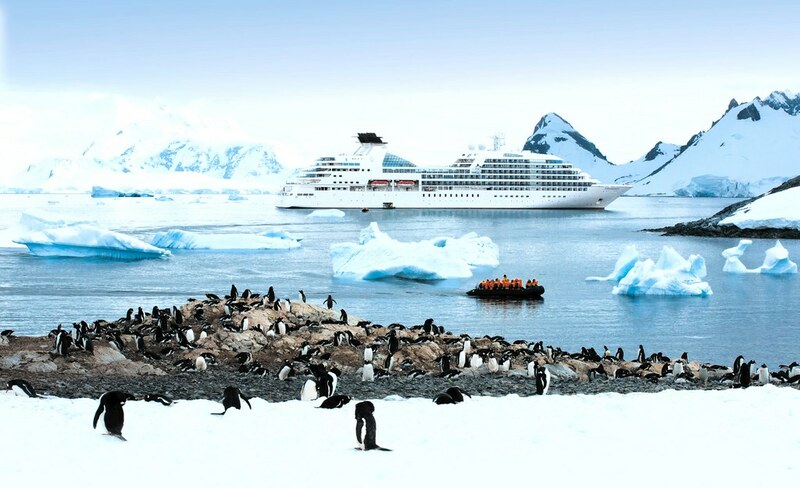 Launching directly from Seabourn Quest’s fold-out watersports marina, guests will have the unique opportunity to explore Antarctica’s exceptional scenery and wildlife close up and at sea level. Led by qualified guides, Seabourn guests can paddle amidst glistening white-blue icebergs, penguins, curious seals and other wildlife in specially designed cold climate dry suits. In addition to Antarctica, Ventures by Seabourn optional kayak excursions will also be offered at South Georgia Island and Port Stanley (Falkland Islands / Islas Malvinas). “The wildlife and wonders of Antarctica never fail to amaze, and Ventures by Seabourn allows our guests yet another up close and personal opportunity to experience its natural beauty,” Seabourn Senior Vice President of Marketing and Sales John Delaney said. Introduced to Seabourn Quest this year, Ventures by Seabourn is an informative, educational and exhilarating way for guests to enhance their cruise experience. The optional excursions are guided by knowledgeable and experienced expedition teams of scientists, scholars and naturalists who are part of the vessel’s Seabourn Conversations program. In Antarctica, Seabourn Quest’s kayak guide will be Matt J. Dolan, who has kayaked the entire Inside Passage from Seattle to Muir Glacier in Glacier Bay National Park, Alaska – a journey that encompassed more than 2000km and a feat few have accomplished. Beginning November 29, 2015, Seabourn Quest returns to Antarctica for its third season of four 21- to 24-day voyages between Valparaíso, (Santiago) Chile and Buenos Aires, Argentina. Each includes days exploring the Chilean coast and fjords, Beagle Channel, Glacier Alley, the breathtaking Torres del Paine National Park, the Falkland Islands/Islas Malvinas, Montevideo and six days of cruising and landings on the Antarctic Continent in uncompromised Seabourn luxury. An extended 24-day itinerary departing December 20, 2015, will include two days exploring the sub-Antarctic wildlife Eden of South Georgia, renowned for its beauty and its vast, teeming rookeries of king penguins and other seabirds, as well as breeding elephant and fur seals. Fares for the 21-day Antarctica cruise on Seabourn Quest departing Buenos Aires on November 28, 2016, start from $19,500* per person double occupancy.